memorizing the basic addition and subtraction facts of single-digit numbers. The PDF version of this book is enabled for annotation. This means that if you prefer, your student can fill it in on the computer, using the typewriter and drawing tools in Adobe Reader version 9 or greater. In the first several lessons we study basic strategies for adding and subtracting within 0-20. After those, we study the idea of completing and going over ten. For example, the child adds 8 + 5 by first adding 8 + 2 (which makes 10), and then adding the 3 that was "left over." These lessons prepare the student for the next part of the book, which has to do with memorizing the basic addition facts. Some children will accomplish this quicker, needing less practice. Some will need more practice. You can also add in some Internet-based games (a list of online games is provided in the book), and also use the fact families online practice program here at MathMammoth.com. After those lessons, we study subtraction. First, the child subtracts to ten. This means subtracting from 14, 15, 16, etc. so that the answer is 10, for example 16 − __ = 10. In the next step, we study subtractions with an answer less than 10, such as 16 − 7. The student practices these by subtracting in two parts: First subtracting to ten, then the rest. For example, 16 − 7 becomes 16 − 6 − 1, or 14 − 6 becomes 14 − 4 − 2. The last part of the book includes various lessons titled Number Rainbows and Fact Families with ..., which give lots of practice and reinforcement for the basic addition and subtraction facts. These lessons also include many word problems. They emphasize the connection between addition and subtraction to solve basic subtraction facts such as 13 − 8 or 15 − 6. Alongside them, you can also use games or flashcards to reinforce the learning of the facts. Learning and memorizing the basic addition and subtraction facts of single-digit numbers is very important for later study. For example, regrouping (carrying/borrowing) in addition and in subtraction requires that the student be able to recall all the sums of single-digit numbers and corresponding subtraction facts efficiently and fluently. The goal is to memorize these facts, or at least become so fluent with them that an outsider cannot tell if the student remembers the answer or uses some mental math strategy to get the answer. The followup to this book is Add & Subtract 2-B, which practices adding and subtracting two-digit numbers mentally and in columns (carrying and borrowing). Please see also the two videos below that explain several strategies for learning addition and subtraction facts, many of which are studied in this book. 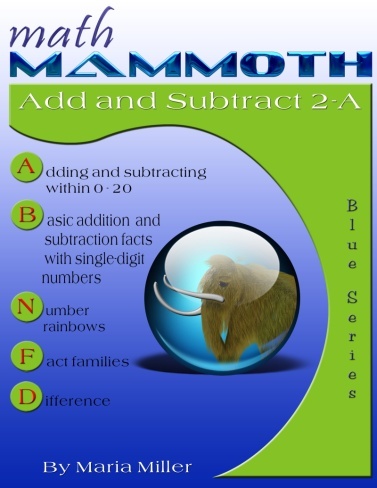 Math Mammoth Subtraction 1—a worktext about subtraction concept, difference, fact families, addition and subtraction facts within 0-10, and word problems (grade 1). 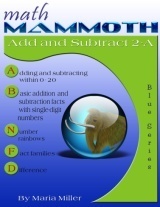 Math Mammoth Add & Subtract 2-B—a worktext about adding and subtracting two-digit numbers mentally and with regrouping (in columns), and word problems (grade 2). Math Mammoth Place Value 1—a worktext about two-digit numbers (place value), comparing, rounding, even & odd, and graphs (grade 1). Math Mammoth Place Value 2—a worktext about three-digit numbers (place value), comparing, ordering, rounding, bar graphs, and pictographs (grade 2). This image was sent to one by a customer. The girl in the picture loves rainbows and organizes a lot of her things by color, using Roy G Biv order. 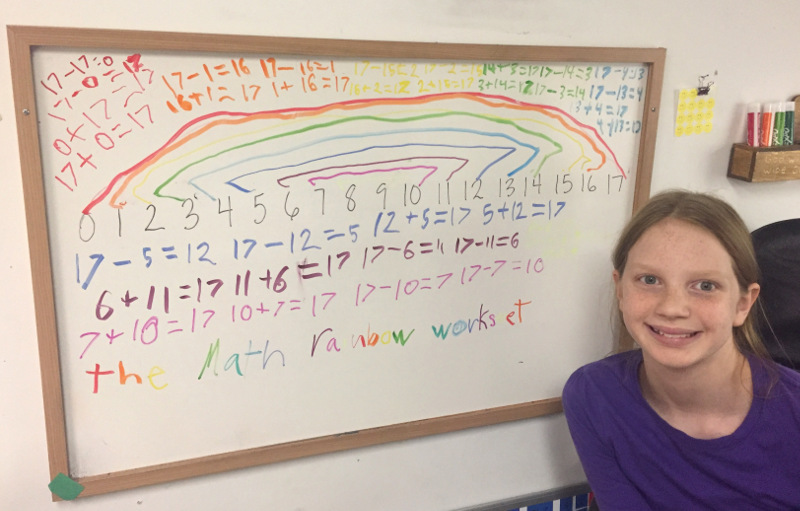 The picture is about her first "math rainbow" for learning addition & subtraction facts, which she was very excited about! We bought the light blue add/subtract and place value books from 2A forward to go back and get what my concept talented but math facts never mastered dd needs to review. Keep doing the great work you're doing. It's amazing to see my dd age 12, who was doing fine with pre-algebra, knows all mult/division facts from homeschool years, but just never got the addition and subtraction facts (when she went to school) gain confidence with the reviews without any grade-level stigma. My son finally doesn't hate to do math. He is a little behind in math and this year with your workbooks he is well on his way back to grade level and with a great understading of how numbers work. Thanks Maria, for helping my son to learn and enjoy math! I have a 2nd grade daughter who just "didn't get" math. We've been using another well known math program which was just moving too fast for her. Fortunately, I had purchased Mammoth Math [Add & Subtract] 2A over the summer and it has turned her into an "I get it" kid! We just completed 2A and will be starting 2B shortly. It's been an awesome supplement and my daughter looks forward to her daily math worksheets! I can't believe how much more confident she's become in her computation skills and she's even soaring with the story problems. Thanks Mammoth Math! The following is one of the winning entries to Math Mammoth 2008 Thanksgiving Contest. Tomorrow we will finish the final two pages in your Blue Addition/Subtraction 2-A. My 10 yo daughter, Gracie, has Autism, and nearly every math we have tried so far has been a impassable trial for her. I really didn't know what to do anymore! Our family has been homeschooling since 1993, and Gracie is our third child, but she has difficulties that our other two simply did not have. I remembered your website from previous web searches, and after reading about your Light Blue series, a light bulb went on! Why not address her individual math skill needs instead of trying to tackle a whole curriculum again? With each of your books costing only a few dollars, there was no risk at all! I ordered the Blue Addition/Subtraction 2- A, downloaded, and printed that very day. Well, it turned out to be just what Gracie needed! You teach math topics efficiently and interestingly, with no extraneous fussiness. After doing a few weeks of your math (slowly - 2 pages per day) Gracie asked to know a bit more about the writer. We went online so she could read your "about" page, and was so pleased to put a name and face to your math books. You see, she discovered that you like patterns, and believes you hide patterns all through your math worksheets. In fact, she now notices lots of math patterns quickly, and makes extra effort with her math worksheets to make sure Mrs. Miller doesn't "trick" her. Her ability to see patterns makes learning math facts so much easier. It never occurred to me (or my Engineer husband) to explain math the way you do. You seem to be speaking her "math language" and - finally - math makes sense to her. Today, I'll be ordering the Blue A/S 2-B, so we can carry on with Gracie's math seamlessly. I'm so thankful you wrote this particular (Blue) series. I'm sure most homeschoolers order the Light Blue Full Curriculum, and I hope it's a good fit for them. But, there are students (perhaps with Special Needs, or just with Math Phobia) who just can't manage a full curriculum. I hope they'll consider the Blue series, which attacks math skills individually, in a way which builds skill-upon-skill, and teaches little patterns and tricks in a very do- able (and reasonably priced!) format. Thank you so much for new edition of the Add/Subtract 2a book!! I gave the new pages as homework tonight and am amazed to see the excitement the rainbows have created working with inverse operations/fact families. Thank you, again! I love incorporating your worksheets into our lessons it has made my children confident independent workers! Your newsletters and blogs are so worth the read!! The information you have and receive about math is making a tremendous difference in my home everyday!! Your consideration, work, time, and effort is greatly appreciated by my family.